Darlene Jean Tomlanovich, age 72, a life long resident of Eagle River, Wisconsin passed away on January 1, 2019 at Friendly Village in Rhinelander, Wisconsin. She was born September 7, 1946 to her parents Al and Lucy Tijan. Darlene graduated from Eagle River High School and married Tony Tomlanovich. She was a homemaker and had a house cleaning service. Darlene loved the outdoors and fishing. She especially loved spending the holidays with family and Christmas was the highlight of her year. 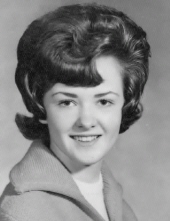 Darlene was preceded in death by her husband Tony, and her parents. She is survived by her sons: Terry Tomlanovich of Eagle River, WI, Jim Tomlanovich of Southfield, MA; brother Bob Tijan of Eagle River, WI, and sister Mary Jo Adamovich or Eagle River, WI. A funeral service will be held at 11am on Tuesday January 8, 2019 at the Gaffney-Busha Funeral Home in Eagle River, Wisconsin. A visitation will be held one hour prior to the service. To plant a tree in memory of Darlene Jean Tomlanovich, please visit our Tribute Store. "Email Address" would like to share the life celebration of Darlene Jean Tomlanovich. Click on the "link" to go to share a favorite memory or leave a condolence message for the family.